It started with just small smartphones, but now people want entire cities to become smart. What does that mean? Together with IOT (internet of things) all elements of a city will be connected. These technologies will lower the energy costs, and make the city life much safer and more comfortable. A 3D Prezi presentation template with a man holding a black ipad tablet computer with a small city on it. A creative presentation template for talking about the future of city planning, urban technologies, mobile communications. Talk about the future landscape of our cities and how technology will make our life better… or worse. 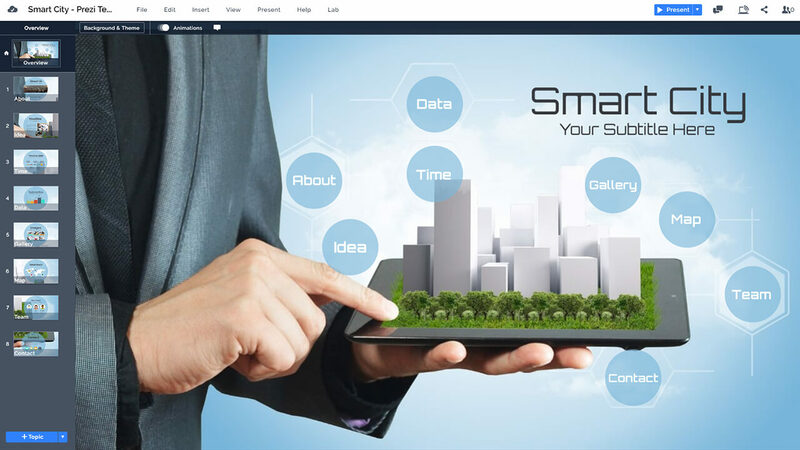 The Smart City template features a close up shot of a businessman in suit pointing a finger a black tablet computer with a small 3D city on top of it, illustrating how technology will enable us to control an entire ecosystem with a push of a button. The template has a blue background with clouds and light technology interface framework graphic, which gives the presentation an interesting hi-tech look. Advance the presentation by zooming into the blue circles hovering above the tablet. You can easily change the colors of the circles and resize/move them individually. Add more topics to your presentation if needed. 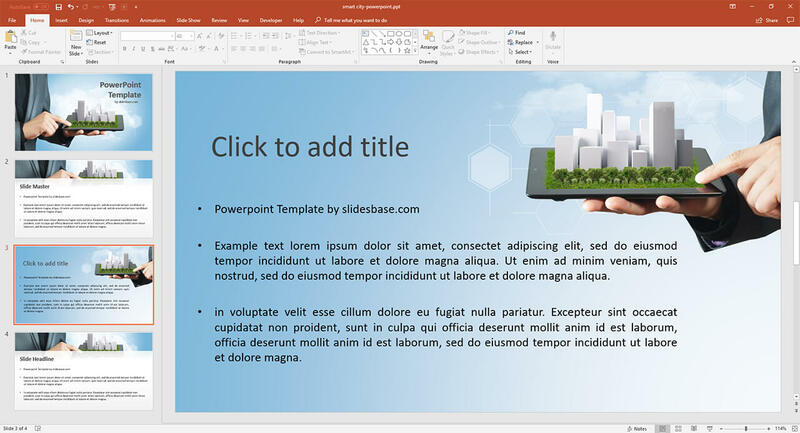 The template also includes many example slides which are already filled with demo content. These include an introduction slide, content slide with text and images, timeline element, business bar graph, vector world map, portfolio gallery page. 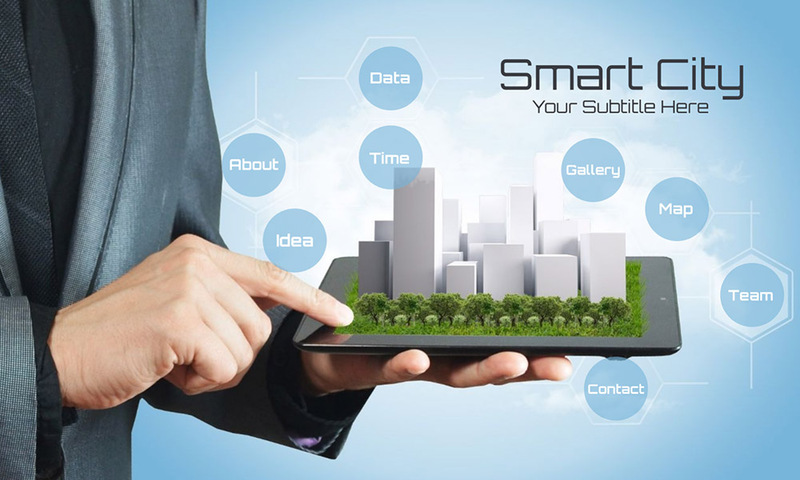 Use the elements to make a business related presentation or introduce your Smart City related startup company. This entry was posted in Best Prezi presentation templates, Prezi Next Templates and tagged 3d city, 3d city on ipad, 3d city on tablet, 3d city presentation, businessman, cisco smart city powerpoint, city in hand, city in hands, city on ipad, city planning, connected city, creative city presentation, future city presentation, internet of things, IOT, ipad, presentation city planning, prezi next city, small city, smart city, smart city on ppt, smart city overview ppt, smart city powerpoint, smart city powerpoint presentation, smart city powerpoint prezi, smart city powerpoint template, smart city powerpoint template free, smart city powerpoint template free download, smart city presentation template, smart concept, technology, urban, urban future.